For patients who are on a budget or in situations where implants or bridges are not possible, removable dentures may be the only solution for teeth replacement. We offer many kinds of dentures to fit every budget. Dentures allow patients to resume their normal lifestyle, improve facial proportions and facial contours that occur when teeth are lost. Normal facial proportions are returned when a person's teeth are replaced correctly. The lips and cheeks are properly supported creating your optimal appearance. There are many different types of dentures such as implant supported dentures, full dentures, partial dentures, cast metal frame partial dentures, Valplast™ dentures, and flippers (one tooth replacement). During your consultation your dentist will discuss all possible options and will guide you so the best possible denture can be selected for your case. Full Dentures, Top and Bottom. These dentures are fabricated when all teeth are missing. Complete dentures can be either "conventional" or "immediate". Made after the teeth have been removed and the gum tissue has begun to heal, a conventional denture is ready for placement in the mouth about eight to twelve weeks after the teeth have been removed. A removable partial acrylic denture usually consists of replacement teeth attached to a pink or gum-colored plastic base, which is sometimes connected by metal framework that holds the denture in place in the mouth. Partial dentures are used when one or more natural teeth remain in the upper or lower jaw. This is generally a good solution for replacing missing teeth in the same arch that are not necessarily together. For example 3 teeth on the bottom left and 3 teeth on the bottom right. Please see the picture on the side. The Metal Frame Partial is our highest quality partial. It is fabricated with a cast metal frame which is customized to fit your mouth. With this partial however, the models are sent to a specialty lab where the custom framework is created. That framework is sent back to our lab where the teeth are mounted. This partial requires several visits, usually two to three weeks apart to complete the process. The time needed to complete the denture from start to finish is approximately four to six weeks. 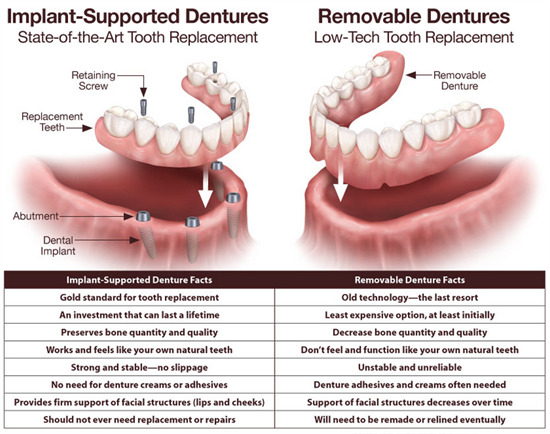 Implant supported dentures and regular dentures.